Welcome to Homeschooler Spotlight. Each week I feature a different homeschooler and her blog. 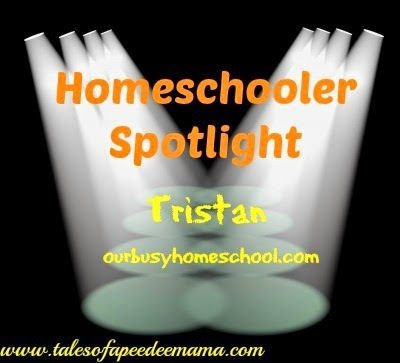 This week we have Tristan from Our Busy Homeschool. She's sharing how she homeschools her 8 (yes, EIGHT!) children. Tristan is a wife, mother to eight, and blogger. She shares her large family learning at Our Busy Homeschool and has a second blog that details parenting a child with medical needs at Mason’s Spina Bifida Journal. - Tell a little about your family and homeschool history. Makayla is 13, our 8th grader. Joseph is 9, our 4th grader. Emma is 8, our 3rd grader. Daniel is 6, our 1st grader. Oliver is 5, our Kindergartener. Caleb is 3, our Preschooler. Mason is 2, our wheelchair dynamo. Samuel is 1, our toddling sunshine. - Do you follow a particular homeschool method? We are a mostly Charlotte Mason inspired homeschool with a dash of unit studies thrown in. What that means is we love to read books, do handicrafts, get out in nature, and sometimes a topic grabs our attention and we pursue it until we are full to bursting with new knowledge. We have a broad curriculum full of ideas to feed the soul so scripture, art, music, poetry – these have an important place alongside the math, writing, and science. - What is your basic daily routine? Our routines are simple. Wake up time is usually 7:30am for the children. Mommy is up closer to 6:00am. Daddy is often already on the road working, though he has Mondays off and joins us in our homeschooling on those days, often taking over part of the teaching. After breakfast and chores we gather on the couch for family devotional where we sing hymns, practice memory work, and read scriptures. Family studies follow as it is easier to do these all in a row instead of the children scattering for individual work and then trying to gather them all back in again. 10:00am is snack time, often accompanied by reading aloud. The next 2 hours find Mommy working with individuals as needed on math, writing, and other things. Lunch is at noon, with more reading aloud. We have a daily quiet time at 1pm and then it’s outside we go. The rest of the day is spent doing projects, reading, playing, and learning in real life settings. For a great look you can also see my One Homeschool Day posts, where I share an uncut look into our home for 24 hours. - What's one piece of advice YOU would give to a new Homeschooler? Keep the HOME part in homeschooling. To me that means several things. First, do not try to replicate the formal, structured, in a desk brick and mortar school experience. Take advantage of the couch, the floor, the backyard – all are wonderful places to study, read, and learn. Second, just because there are a plethora of classes, activities, and opportunities to join does not mean you SHOULD participate. Choose wisely the activities that draw your family out of the home. Do not overload the family schedule, it is a sure road to burnout. - What are your biggest challenges homeschooling? Currently my biggest challenges in this homeschooling adventure fall in two areas. As a mother of eight children I have a lot of balancing to do! I have five official students this year ranging from 8th grade to Kindergarten, as well as 3 little boys ages 3, 2, and 1. I have to be flexible and ready to jump from playing spies with my littlest boys to figuring algebra with my oldest and then work on teaching reading to the 5 year old, all while helping the 4th grader learn division. They say using your brain keeps it young and mine is getting a workout! The second challenge right now for our family is maintaining a steady pace in academics when Mommy is often gone at medical appointments with the 2 year old, Mason. He’s got quite the range of medical needs and in his short 2 years of life has had 14 surgeries (7 brain, 2 spine, 1 back, 1 hip, 1 leg, and two more surgeries) and over 200 medical appointments. In the last 10 days Mommy and Mason spent 25 hours at 5 unexpected medical appointments. To cope with this challenge we have taught children to work independently where they can, we have combined ages so we are not teaching five different science or history lessons, and both Daddy and Grandma have taken over the teaching when needed. - What is your favorite thing about homeschooling? Learning as a family! We are an intimate part of one another’s lives and the learning excitement bubbles from one child to another often. You can read one example of a day where learning rippled through the family here. - How do you respond to those critical of your choice to homeschool, or how you've chosen to do it? I try to see their comments as coming from a love for my children and respond kindly, but firmly, that this educational choice is rich with blessings for our family. - What are your favorite homeschool books, web sites, or resources? A few of my favorites include Simply Charlotte Mason and Brave Writer. Both have blogs that are a treasure trove of encouragement. I love their products as well! - How do you homeschool while keeping up with family, housework, etc? This is an area I have done an entire blog series on! The secret is that many hands make light work IF you put in the time and effort to train those hands to help. Feel free to read our family’s chore journey and training plan in the Operation Chore Training posts on my blog. - What are your strategies for homeschooling with littles underfoot? Include them! We do many of our subjects in a multi-age group and the learning and fun are rich with these sweet and energetic little ones providing us with laughs and love. In almost everything there is a way to include little ones. This week, for example, when my five school age students worked on learning physical geography terms we made some homemade play dough and started building them. The younger children love play dough and it was the perfect medium to build canyons, bays, plateaus, and more.